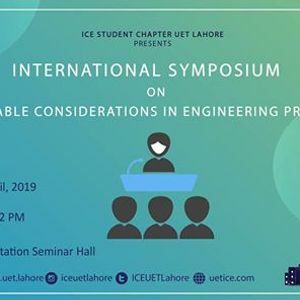 ICE UET working under the motto of "To Promote and Develop" ensures students of campus to bring them best of the events so they are armed with the skillest to face the modern world competition. The Mega-event CIVCON 8.0 is here but this time its not only CIVCON, it's even much more. 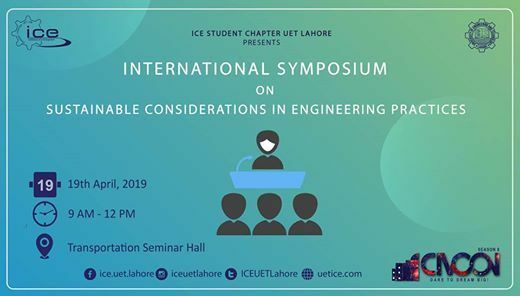 Yes, Followed by CIVCON 8.0; ICE Student Chapter, UET Lahore takes pride in organizing an "International Symposium on Sustainability Practices in Engineering". Aiming at bringing students, researchers and experts together at a point to share knowledge and widen the horizon of a topic which is the need of the hour. Don't miss out to be a part of this amazing forum and not only learn current knowledge by our international speakers and delegates also gain international exposure. Stay connected for further details!